Tragedy As Another Nigerian Football Star Dies! 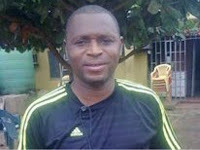 Another tragedy has hit the football community with the passing away of Nigeria Youth International, Peter Ogaba. Ogaba, 42, died after a brief illness in Abuja, PREMIUM TIMES understands. It was not immediately clear when he died. Ogaba is fondly remembered for being the youngest Nigerian player at the FIFA U-20 World Cup hosted by Saudi Arabia in 1989 where Nigeria lost in the final to Portugal. He was also the youngest player to feature at the FIFA Under 17 World Cup at Canada ’87. The Nigeria Football Federation, as well as other teammates of Ogaba, have already been paying tributes to the former youngster. “We are shocked to hear of the sad demise of former Junior Int’l Peter Ogaba. Ogaba was part of the Eaglets at Canada 87,” the NFF wrote. During his active days, Ogaba played in KSC Lokeren in Belgium. He went on loan from Lokeren after sustaining a hamstring injury to Finland, FC Oulu, where he won the league. Ogaba’s last known club was MSV Duisburg who he played for in the 1993/1994 season.